Multiple video formats, keyboard and mouse with options for data and conversion to SDI – unparalleled power for your remote desktop. 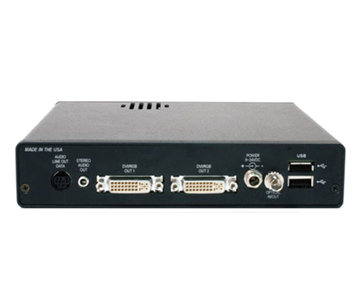 The KVM–6000 is designed to transport computer graphics while extending computer control via USB and serial data transport. 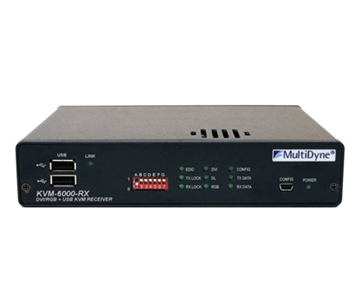 With the addition of audio transport, the KVM–6000 becomes a complete solution for remote access to all the functionality of a computer destop. With USB 2.0 transport included, the KVM–6000 goes far beyond a standard remote destop allowing other peripherals such as printers, scanners or even web cams. This all over just ONE FIBER*. The video transport section supports high–quality RGB–HV, DVI–D and DVI–DL through a DVI–I interface and is designed to increase the transmission distance limitations of high resolution RGB and DVI video and computer graphics. The KVM–6000 Single Link system will transport virtually any VESA–compliant DVI or RGB signal from 640x480 VGA up to and including 1920x1200 @ 60 Hz Reduced Blanking WUXGA. The dual link version will suport WQXGA (2560 × 1600) @ 60 Hz.